LONG BEACH— 162 games have been played. 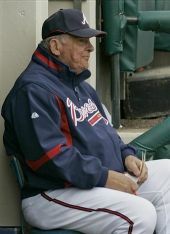 Chipper Jones has secured another mark in history, that of the oldest switch hitter in history to win a batting title. Chipper scratched out a .364 mark for the year, one point lower than his idol Mickey Mantle hit during one of Mantle’s best seasons. Brian McCann entered another incredible season into the books banging out the best numbers in the majors at his position. Other than that though there wasn’t much to be happy about. Along the way to reaching McCann and Chipper’s fabulous seasons the Braves coughed up 90 losses while watching nearly as many injuries hit their team. Among the victims are two Braves icons, John Smoltz and Tom Glavine. It doesn’t look so good for those two as each was reaching the end of his career only to be put down with season ending arm injuries. Chronicling the fall of each injury story one can see why and how this team managed to drop like a stone. Before a regular season pitch was even thrown presumed closer Ralphael Soriano went down with what became cronic elbow pain eventually requiring season ending surgery to shuffle some nerves around inside his arm. The top set up man, Peter Moylan went down shortly there after with season ending elbow surgery. This left a gaping hole in the back of the pen. The hole wouldn’t have been so bad had the Braves alt-Closer Lefty Setup man Mike Gonzalez been available. Alas, he was injured midway through last season requiring elbow surgery and postponing his return until midway through this season. The rotation was already hit hard by Mike Hampton’s inability to heal at a sustained rate. Within two month three of the rotation’s five starters were on the DL. One starter from last year was pulled off the DL, bum shoulder and all, in an attempt to fill in, only to fail miserably and eventually be relegated to season ending shoulder surgery. Covering the rotation at this time were two rookies, one young, one not so young. Jiar Jurrjens and Jorge Campillo became the 1-2 punch for the team. They did a great job for being rookies but it was pretty obvious this team would struggle with no rotation and no bullpen. Center fielder Mark Kotsay did well in his healthy playing time here but even he wasn’t immune to the DL. But as far as outfield issues go, he was on the minor end. Having had back surgery a year prior it wasn’t surprising when he went to the DL. What didn’t help was having Matt Diaz flop out of the gate into a wall resulting in tearing his leg up and landing on the DL until the final series of the season. Additionally young right fielder Jeff Francoeur trained all off season with a football team only to get out on the field and struggle over the much longer and much more taxing 162 game marathon that is the baseball season. On the infield Mark Teixeira got off to his pattented sluggish start leaving a lot of the weight to be carried by sophomore Yunel Escobar, who eventually went down with a soar shoulder. Kelly Johnson was tossed all over the batting order due to his ability to watch pitches. This resulted in him watching too many pitches only to see his production over the heart of the season resemble a rookie in deep water. In 75 games between May 28th and August 23rd Kelly posted a .243 average with a .667 OPS including 3 home runs. All this resulted in a fourth place finish. The good news, the season is over. There is a lot of money to spend this off season. There are no delusions about the depth and skill of the players and the team. A lot of work is needed to get this franchise back on track. Over the next few weeks we here at the American Missive will break down this team and try to shed some light on good spots and bad spots. Sadly the most exciting part of the 2008 season will occur during the off season. In the mean time, anything you would like to add or say concerning the Braves or baseball would be welcome. Hammer away. The post season is here. And for a change in pace, New York City isn’t involved thanks to another Amazin’ Met Collapse. Bobby, Chipper, Tom and John are all first ballot HOFers and class acts. I’d pay to watch play. Mr. McCann is also a very good looking young catcher. I have a soft spot for the Braves as they were once the Boston Braves and Tom Glavine is a Bostonian! My senior year in High School we got knocked out of the tourney way earlier than we were predicted (pre season we were ranked #3 in Division 1) and the team we lost to played Glavine’s team (Billerica High) and Glavine pitched!!! I always hit lefties well too! I like when you talk Baseball, it’s the only time my blood pressure doesn’t rise on this site! Yeah, it’s a shame the Red Sox made it in over the Twins. 🙂 I’m hoping the Brewers play the Rays. I’d love to see the two small market teams step over the big spenders.